I am a born worrier, one of my 2016 goals that I completely failed at was to worry less. I worry about every single eventuality there is, I have been a worrier for as long as I can remember but in recent years having been diagnosed with depression and anxiety my worrying has gone to a whole new level and at the moment because of some awful things that myself and also my family went through in the later months of 2015 and earlier months of 2016 my anxiety is at an all time high which means my worrying is affected and is bordering on ridiculous, I know it's not right but can't seem to stop worrying and it is affecting me and I need to try and stop worrying so much. Unfortunately my daughters are also worriers, Cole has Aspergers Syndrome so she has very black and white thinking but she also obsesses about things, so she worries about things such as the house falling down because the roof is leaking, I can always speak to Cole and rationalise things with her and she is fine then but my youngest daughter is more like me in that she will worry about something and the worrying can take over and she won't think rationally at all about things. A couple of weeks before Christmas, I saw a book on the ASOS website called No Worries, the title instantly drew me in so I clicked on the image to find out more about the book. No Worries is a journal and is ideal for people like myself and my daughters who worry a lot, when I'd read into the book I thought it would be perfect for myself and Lissy, not so much for Cole, it isn't really something she would be interested in. I told Lissy about the book and said I was going to pick it up for us both, but unfortunately it was out of stock and stayed that way for a while. Lissy has access to a book store through her university and they had it in stock so she surprised me by buying me a copy, she also bought herself one. No Worries is a brilliant book and something I wanted to share on my blog because I feel it could help a lot of people like me who worry a lot. No Worries is a journal, a book you fill in, the book also has lots of inspirational quotes throughout which I have found really helpful, a couple of my favourite quotes from the book are "worrying is like a rocking chair, it gives you something to do, but it gets you nowhere" and "my life has been full of terrible misfortunes, most of which never happened" the second quote is most definitely me! 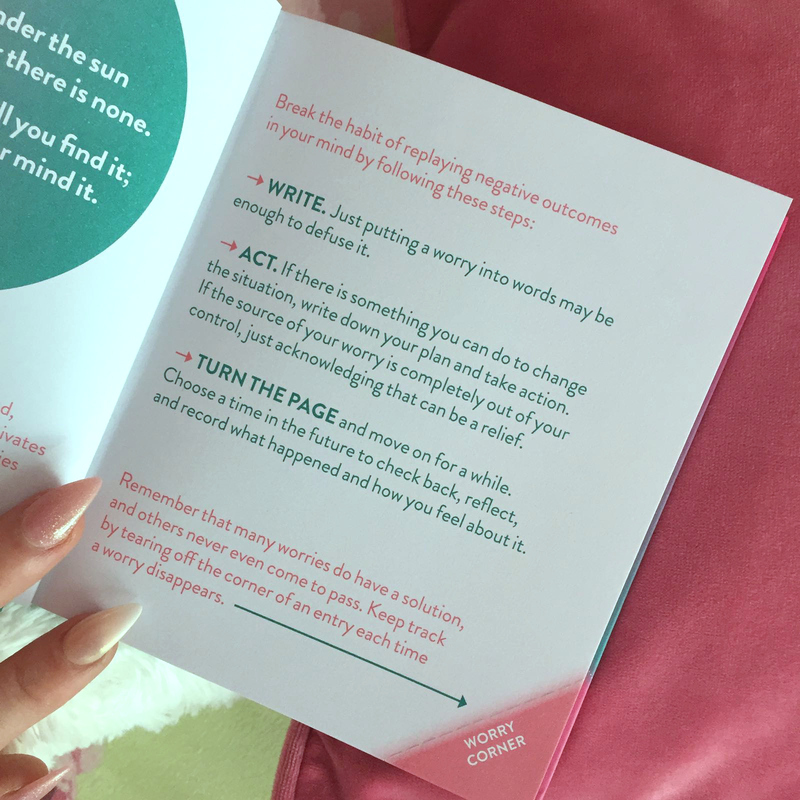 Aside from the quotes the purpose of the No Worries journal is to break the habit of replaying negative outcomes in your mind, there are steps to follow and sections to fill in. Each page has steps to follow and both the right hand page and left hand page work together, on the right hand page at the top is a space for the date, it is blank for you to fill in and just says "Today" and then has gaps for the day, month and year. Under the date it says "This is my worry": and then there are a few lines for you to write your worry, under than it says "Can I do something about it?" and then there is a "Yes" and "No" section, under the "Yes" section there are arrows and spaces to write and it says "Here's my plan" so you can write what you aim to do about the worry and where it says "No" it says "Time to move on and check back later"
Then on the right hand side of the page it says at the top "Checking back after - Days - Weeks - Months" and there is a space to write how many days/weeks/months. Then under that is says "What happened" and there is a few lines to explain what happened, then under that space it says "How I feel now" and again a space to write how your feeling. Next there is "No longer a worry? 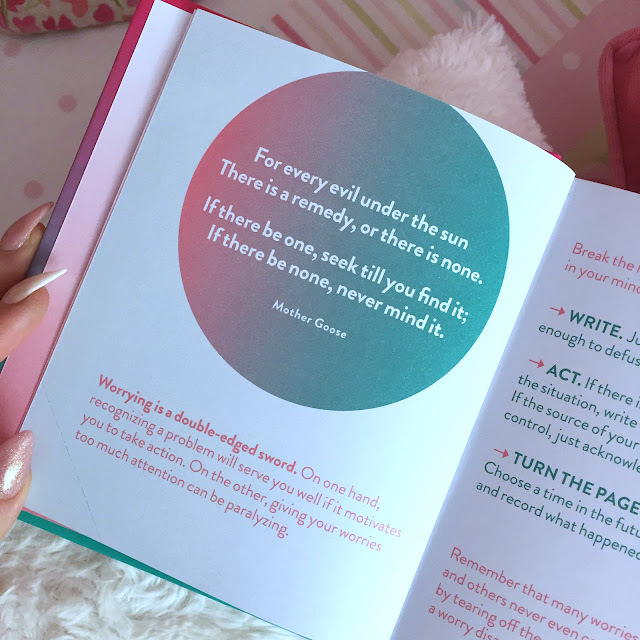 Tear off the tab" and an arrow pointing to the corner of the book which has a tear off corner in pink and says "worry corner" on it. I absolutely love the concept of this journal and I am really hoping it can help both me and Lissy with our worrying. It is a great book, easy to fill in and something that isn't too time consuming and can be done in a couple of minutes and it will be so good to be able to tear the worry corners off too if and when my worries are sorted out. I will of course come back and let you know how I am getting on with the book and if it has helped me but I am hoping that if/when I start to see that some corners have been torn off, it will help me not to worry so much. 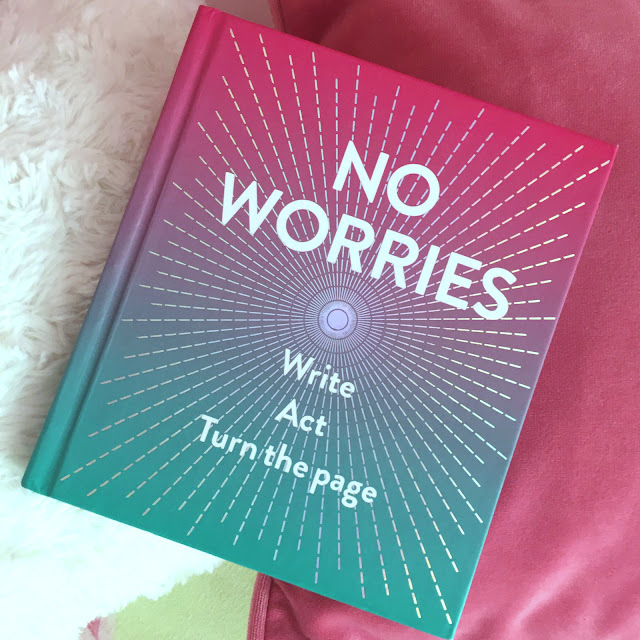 If you would like to purchase the No Worries journal for yourself or for a friend/relative, you can find it HERE on the ASOS website priced at £9.99 or HERE on the WHSmith website priced at £9.20 or HERE on the Amazon website priced at £9.99. Do you or a friend/relative of yours worry a lot? 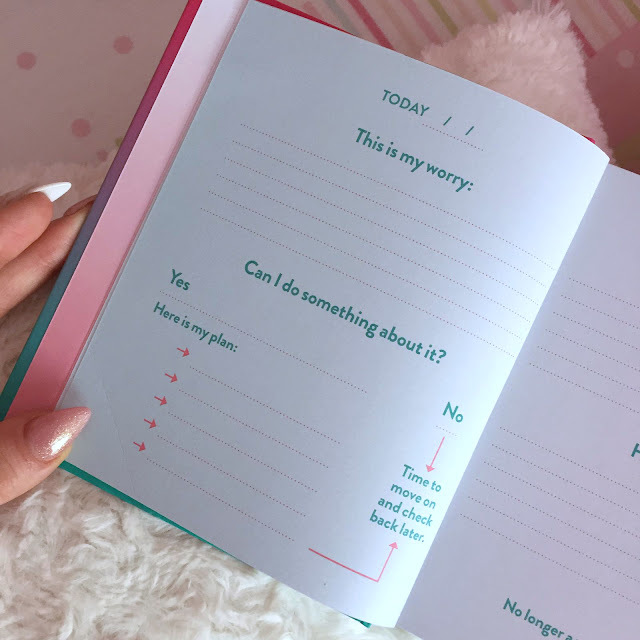 What do you think of the No Worries journal, is it something you would buy to help yourself or a friend/relative? Do you have this journal and has it helped you? Please chat with me in the comments and let me know.